The nice part about tacking on a vacation at the end of a business trip is that you can usually get to see places you normally wouldn't without the cost of plane fare. The downside is you have to lug your presentation materials, dress shoes, ties and business suits with you for the balance of the trip. It is with that reasoning that my Bike Friday New World Tourist - which did get to visit Barcelona recently - didn't go with me to London a couple of months back. My wife and I indeed had enough luggage to keep track of when we took a train from King's Cross Station. After an overnight stop in York (where I unfortunately came down with a cold) we continued our journey. We mostly saw fields, sheep, some water, and more sheep. Yes, we were on our way to Edinburgh, Scotland. We were only going to be there for two nights but I hatched a plan over a week earlier: I'd rent a bike upon arrival and return it just before we'd have to catch a train back. Sure, I wouldn't be able to use it all the time, but I just wanted the peace of mind that I could use it anytime. And it would be a folding bike so I could easily bring it into our room at the Radisson Blu and other places without trouble. 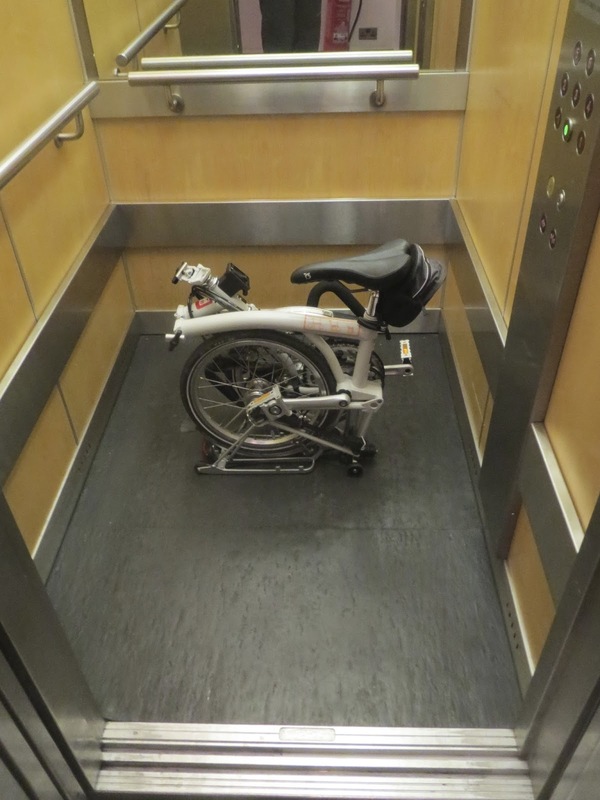 This would be an unusual trip, for I would be renting not just any bike, but a Brompton; the legendary and out-of-my-price-range folding bike I was fortunate enough to see made in all of its spectacular detail last year at the Brompton factory in London. 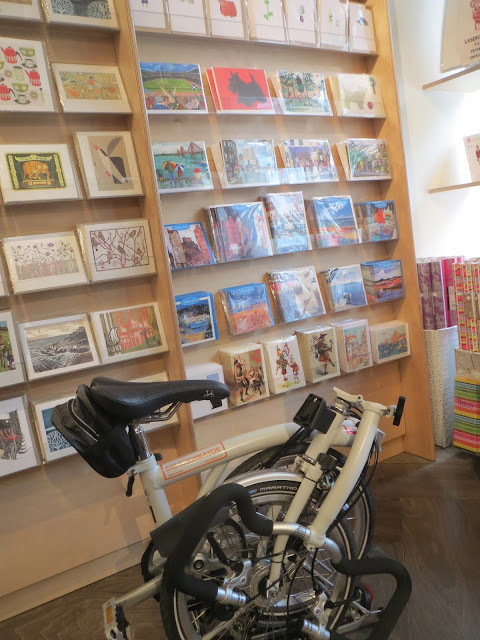 This is Biketrax; a shop in Edinburgh I walked to at great speed within minutes of checking into the hotel. As it happened, I was renting the kind of Brompton I had always wanted: one with six speeds, a rear rack and funky handlebars. I signed a form and the friendly clerk showed me how to fold it…before he unfolded it again. Minutes later I left the shop with a bike that would be mine for less than 48 hours. I didn't ride it much in the first hour since my wife and I were walking together through Edinburgh while she was looking for a good place to sketch, so I was only able to admire how well the bike could be maneuvered on a crowded sidewalk. Our first stop at the Paper Tiger embarrassed me completely. Not because of the store's content, but because it took me a couple of minutes to fold the Brompton properly. I hoped beyond hope nobody was on the street taping me. Yes, I had barely paid attention at Biketrax. I actually saw these things being made - I even held the key hinge mechanism in my hand. I had also stared with awe at enough of them being folded in the wild to know how to fold one properly. As it turned out, my wife was in Paper Tiger viewing me through the window with much bafflement. I finally got the bike folded and carried it inside. We spoke little of my humiliating display. After visiting a couple of other shops, I put on my helmet (I always bring my own wherever I go) and hit the pedals. I quickly discovered two things: Edinburgh has quite a lot of cyclists and the Brompton is truly in a category by itself. Aside from the short ride I did in Philadelphia, this was the longest ride I had ever been on with a Brompton. It felt solid, nimble and comfortable. The only thing that niggled me was the shifting as I found myself having to push the levers with a lot more force than normal to get the bike to change gears. 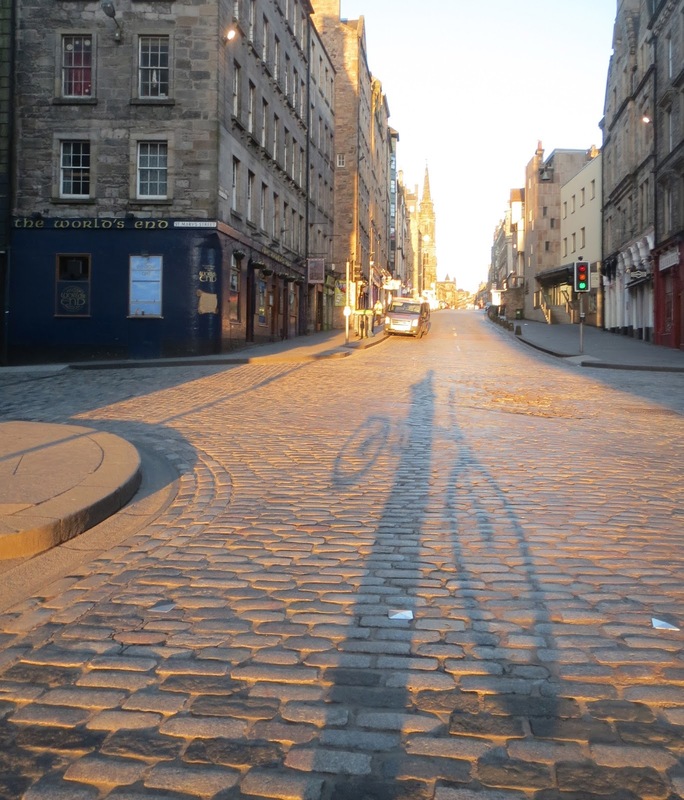 I wondered if it was a quirk because the bike was new and even worried the shifters would break under the pressure, but they didn't and I was able to join Edingburgh's cycling community with style and without problems. When I later brought the Brompton to the hotel for the first time (this fold went only two teaspoons easier than the earlier one) I realized that a folding bike is really a good option to rent because absolutely nothing else could possibly fit in the claustrophobia-inducing elevators - and this was one of the larger ones. So I had a bike in my room that could fold and unfold easily (by someone more talented than myself) that I could use anytime I wanted. This meant I could take a ride early in the morning, since the view outside of the hotel room window at dawn is quite irresistible. Although parts of the city put me in touch with my old nemesis (cobblestones), I enjoyed pedaling up to see some of the sights, especially early in the morning when the places were devoid of cars and tour buses. It was here that I managed to see the whole scope of the city. Turning around I could see some hills off in the distance, which I knew was Holyrood Park. I want to ride there, I thought. The Brompton worked perfectly through all of this and it was quite nice to see that the dynamo-powered headlamp and taillamp were working well - even though the sun quickly lit up the city and made visibility a whole lot easier. Since I didn't have a map with me I can't name all the places I went here, but I can tell you the castles do look nice. I just wanted to go to the walls of this one clapping two coconuts together and tell the inhabitants of my search for the Holy Grail. Before long, I had reached the peaceful streets that would soon be crowded with citizens and tourists in a matter of hours. But for now it was just me, my Brompton, and those dreaded cobblestones. Back at the hotel, I folded the bike (with a little more grace than the previous attempts) before my wife and I set off on foot to see some of the sights and she could work on a few sketches. After lunch, I had the chance to take the Brompton out once more and decided to head for the hills. I easily found Queen's Drive - the road to Holyrood Park - that went up. And up. And up. In the proper gear, my legs burned but I still was glad I was pedaling what I was pedaling. It was also a narrow road (one-way) so I was also thankful of the helmet mounted rearview mirror. To my surprise, just as this hill was leveling out, I came to a small pond, which simply added to Edinburgh's wonder. As the road leveled out some more and began to slowly tip downward, I realized that this location would be a fantastic one to watch the sunrise - If I could awaken early enough the next morning. As the road bent to the right, I was offered views of the city that a lot of people - myself included - stopped to enjoy. I did stop and dismount the Brompton so I could walk up a rough dirt pedestrian path to get more views. I didn't want to abuse my rental, so I refrained from riding the bike. It did occur to me that if I would ever film a mountain bike commercial, I would do it along this stretch. When I got the bike back to the tarmac, I was able to open up the throttle. Even though I didn't bring my bike GPS and had no idea how fast I was going, I can tell you that a tuned Brompton does give one a lot of confidence at speed. I thought that ride was so nice, I did it twice. After returning the bike to the room and reuniting with my wife, we wandered around together some more. We discovered two things: it is very difficult to see this city in a bad light, and when a guy in a kilt is playing the theme to 'Star Wars' on his bagpipe, it is pretty awesome. Very tired by the time we returned to our room, we slept soundly before I woke up in the dark. I wasn't sure what time it was but I knew the sunrise was imminent. Being careful not to wake my spouse I brought the Brompton downstairs and unfolded it with a lot more grace than the previous attempts before hitting the road. Now I was really thankful for the headlamp. I knew this would be my last ride (not counting the trip I'd have to take to return the Brompton) in Edinburgh, so I wanted to make it count. The bike moved quickly and even the shifting felt easier as I raced toward the entrance to the windy road I had done twice the day before. I've confronted no trespassing signs before that have given me pause, but not like this. A quick scan of the road didn't put any amphibians in my line of vision, so I rolled the Brompton to the nearby sidewalk and pushed it into the road behind the gate. How nice to be able to ascend this without the threat of cars approaching, I thought. I didn't have to go far before I began to see the view I wanted to see. Still no sign of toads on the roads, I finally climbed up to the little pond, which would be my resting place as I'd watch the sun rise in Scotland. For several minutes I just stood very still waiting for the sun to come up. There was no cellphone in my pocket that would ring with a notification and no place else I needed to be. I need to remember to put myself in that sort of position more often and I highly recommend it to others. All other times of the year I just seem to try to find ways to make things move faster but there is something to be said for watching things move slow. It was only when the sun was fully exposed that I turned around and realized I must not have been the only person skeptical about the toad migration thing. This is also a suggestion to those of you with sturdy hiking boots and flashlights if you want higher ground when you visit Edinburgh, for somewhere up those paths is 'Arthur's Seat' which is the highest point of the park. After peacefully descending back into town, I returned to the hotel, folding the bike fairly quickly, and carried it back to the room where my wife still slept. After excitedly telling her what I saw and having breakfast, I did what needed to be done: I rode the Brompton back to where I had rented it, stopping to take some final shots of the city on the way back. At Biketrax, I did something that made me happy and sad at the same time: I folded the Brompton with speed and grace as though I had done it every day of my life. And of course, just when I was getting good at folding and unfolding it, I had to turn it in to Biketrax, who I thanked profusely. I was sure it wouldn't be my last trip to Scotland or my last ride on a Brompton. It was an unforgettable trip on a true example of how great a folding bike can be. And I realize that the sunrise ride would not have been at all possible on any other bike: renting a folding bike for two days and having the freedom to bring it into the room gave me the chance to ride when and where I wanted - and not be bound by a set couple of hours when a rental shop is open. So if you are lucky enough to visit Scotland, do yourself a favor and rent a Brompton for a period of time much longer than you'll think you need. You will appreciate its presence in your hotel room and enjoy the fact you can take off on a moment's notice. I appreciate all Folding Bike Week fans for tuning in this week. Thanks for reading and thanks for riding.